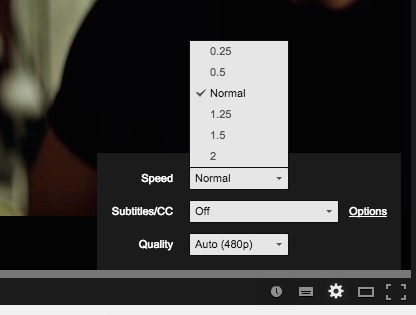 It seems that YouTube supports faster (and slower) playback since mid-2014, on their new HTML5 player. Why is this a good idea? Because I find that watching at 1.5x doesn’t affect my understanding of the content. Of course, it depends on the video: how technical or complicated it is, how well edited it is, and the signal-to-noise ratio. For a typical 1-hour conference presentation, at 1.5x, that’s 20 minutes of my life that I get back. If you don’t want to click, like me, there’s a keyboard shortcut to decrease/increase the speed: < and >, respectively.